No, not that kind of swamp people. 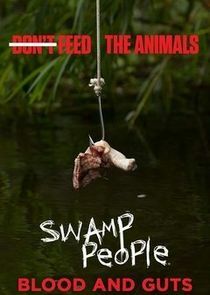 Swamp People: Blood and Guts is not a show based on a B horror film. The 'Swamp People' featured in this History channel series are the proud descendants of French Canadian refugees who settled in the swamp region of Louisiana in the 18th century. Cameras follow members of this fiercely independent group as they struggle to preserve their way of life in the Atchafalaya Basin during the most important time of the year for them: alligator-hunting season. On the final day of the season, Troy's future as an alligator hunter is on the line; the Edgars have more tags to fill on the last day than ever before; RJ gives Jay Paul the ultimate captain's test; enhanced.